I first met Jim Littleton through his daughter Bridget, a truly talented and accomplished student of mine at Ave Maria University. When he brought up, I asked to see his manuscript on suffering through a possibly fatal cancer, this father of fourteen living, thriving children. If you want to read a beautifully simple and candid book, a spiritually deep book, by a man enduring a particularly lethal cancer, here is your chance. This brief book that is permeated by a deep Catholic faith, which informs every one of its sentences. It is in Christ's sense childlike and direct. If you have never encountered such an adventure, this is an easily accessible and non-threatening record of human experience too precious to miss. Fr. Joseph D. Fessio, S.J. Healed through Cancer, and Other Adversities is a profound but deeply personal story of one man's response to serious illness. James Littleton writes of his own story: how a businessman and father of 19 children, struck by cancer in the form of Chronic Lymphocytic Leukemia, responds to the challenges of such a terrible illness, with the help of his family. He writes of being sustained constantly by their prayers, and by their sacrifices as they ease his discomfort and support one another. Each word of this book is emotionally personal and moving, and manifests the true motivation behind Mr. Littleton's ability to persevere, his faith, which is also the cornerstone of his recovery. The book consists of a series of meditations, interspersed with a chronology of suffering, treatment, and recovery. Anyone who is suffering from a life-threatening illness, or supporting a family member or friend who so suffers, will find sources of support for their own struggles in the examples found in the book. Anyone who has ever wrestled with life's problems will find resonance with Mr. Littleton's words of his own tremendous challenges. Healed through Cancer, and Other Adversities is certainly a testament to Mr. Littleton's Catholic faith and to the strength and support which this faith offers. The book is, at the same time, eminently accessible and understandable to people of all faiths, or anyone seeking to understand the comforts of faith. Mr. Littleton translates his deeply personal and profound spiritual struggles and thoughts into a style that is pleasing and easy to understand. Jim and Kathleen Littleton have my heartfelt endorsement as speakers and catechists of our precious faith. Their kind and soft spoken approach to difficult and challenging Catholic topics is a blessing to our church. They rightly see the centrality of marriage issues in our culture wars today, yet seem to witness more with their lives than beating anyone over the head with the Bible or Encyclicals. Fr Thomas Koys, M.A., S.T.L. Totally in line with Catholic Church teaching Click here to see letter of recommendation from our Pastor. Christopher Cannonito, President, Cannonito Associates, Ltd. When Jim Littleton speaks about Christ you know that he is talking about someone he knows, loves and serves. Jim’s love for Christ has been kindled by a life of prayer and service -- by a life touched by both the dark shadow of the cross and the joy-filled light of the resurrection. Hearing Jim speak stirs one’s heart and makes one desire to grow evermore in love for Christ. Jim Littleton's story is a witness to the miraculous transformation that accompanies the submission to God's will (METANOIA). Every husband and father needs to hear Jim's story! Jim is a an effective communicator. His life experience and storytelling is nicely complemented by his wit and delivery. He is poised and effective in front of large audiences or small groups. Jim connects with everyday people and inspires action for many. His message was a gift and an inspiration to our faith community that is still changing lives. I highly recommend Jim as a public speaker. "A cancer diagnosis can test even the most devout faith, and can cause severe rifts within a family. The Littletons are anything but typical! They attack obstacles with head-on determination as one unit to face down any life-challenge regardless of the severity of the storm with no dent in their trust in God. This book is moving and real!" How a big family deals with a big illness. Yes, there really are modern-day miracles and modern-day heroes. This book introduces you to an amazing family with 14 children and how they deal with dad's life-threatening illness. If you are a person of little faith, here is a spoiler alert: by the end you will have trouble NOT having faith. When I got to the words "We were being purified, and God was stripping us of our earthly attachments so that we might come to love Him even more, rely on Him more fully and render all the glory of His saving power back to Him in testimony," the Spirit of God moved mightily upon me, and I could sense His strong anointing upon this book. When God's anointing is upon somebody's life, it is no longer the individual who speaks, but God. I have no doubt that God is going to speak to many people through this book. No doubt whatsoever. I just delighted in watching and listening to you on EWTN Live this evening! Your gorgeous children and your "radical" "pouring out" of yourselves in your "YES" to God amount to some of the most inspiring faith I think I've ever seen. I was particularly moved by your profound grasp of the Faith and your easy, articulate expression of it throughout your interview. And what a rude shock it was to change the channel for a moment, after the close of your program with Fr. Mitch, and find myself instantly back in the secular, modern world of self-preoccupation. Thank you, thank you for your gracious, generous, love-filled witness! May God continue to bless you both, and all your children, with His ever deepening love and strength. P.B. It was a great show. Ramona and I watched it from home in Hanceville. What a witness to the power and love of God and God’s love for family life. B.S. Dear Jim and Kathleen, After finishing your book I feel I actually do know you both plus your children. I liked the book very much and am recommending it to others. Gee, I feel like a piker with only 9 children. We wanted a dozen but after 7 miscarriages it was not to be. Kathleen, did you find that when women found out how many children you had (any over the number 5) the ladies would look at your face and then your stomach and then back to your face. It was something they all did!!!! Not sure what they were thinking but apparently they didn't see what they were looking for because they would then say, "You don't look like you had that many". The comments you wrote about I could identify with. We now have 22 grandchildren and 11 greats. God has blessed us abundantly. God bless each of you and carry on!!!! You are all doing a fine job. Know there are lots of challenges but lots of rewards, also. Keep the faith and keep smiling!!! Prayerfully yours, D.D. PS Much, much later. Interruptions. Are you familiar with them????? Talk about a domestic church! Yours is like a cathedral! S.S.
Hi, I saw your interview with Fr. Mitch on EWTN and wanted to tell you how inspiring it was! I took my daughter to Mass this morning and it was great. We are going to try to go daily. C.B. Very good presentation on EWTN. like to know what ages are your kids eldest to youngest. L.R. I saw you on the live show this morning I would love to talk to you. God bless. A.M. Saw you last night on EWTN and I ordered the DVD (1st time I ever did that). God bless your witness. P.
I just wonder how what your children answer to people and peers who may poke fun at or comment not too nicely on having so many siblings ... in this day and age of having only one or two children. I commend your family and will thank God there are Catholics like you, there to give example to the rest of us selfish Catholics, or so-called, right? Thank you. H.P. Hello, I accidentally stumbled upon the EWTN Live program today in which you and your wife were guests. I wanted to tell you 'thank you' for being what a true Catholic husband and father should be. You have become an example of what God created a Catholic man in the state of matrimony to be. You are a leader, a quality all but lost to men of the modern world, especially a spiritual leader, reminding me so much of Mr. Martin, Little Therese's father. I couldn't help crying watching you speak on EWTN with such joy of Faith, such gentleness yet power, such love for your wife and children, such strength in Faith..... It does my heart so much good to see that there ARE in the world happy families, happy marriages, Catholic lifestyle. How good it was to be reminded that good Catholic men like you exist. Thank you for being a ray of sunshine in a dark, lonely world. Thank you for being open and supportive of life. I rejoice seeing happiness, seeing the right way to live, seeing Catholicism in action. My heart REJOICES when I see happiness and Faith. Thank you for the encouragement. Thank you for your courage to live a Catholic lifestyle. Thank you and your wife for the sacrifices. Thank you for a wonderful example you are to the Mystical Body of Christ, to the world. V.M. Dear Mr. & Mrs. Littleton, Am now watching you on EWTN. Thank you soooo much for your witness to bringing Christ’s love into the world through your holy family. Thank you for your sacrifices for the Body of Christ. Thank you for your dedication to Our Lady of Guadalupe, Empress of the Americasand Mother of the Unborn. How awesome is our God and the work He is doing in you! May he continue to pour His blessings on you and yours as you do His Will, which is Love and Mercy itself. Prayerfully yours, S.M. Hello Littleton Family, This morning we were so blessed to see your appearance on EWTN with Father Mitch. You are truly inspiring. R.D. Hi Jim & Kathy, Thank so much for your witness about, your love for your 14 children, praise God that is just wonderful and I like your spiritual life with Jesus and Our Lady. J.D. Jim & Kathleen, We saw the show last night on EWTN. It was Great! Thank you for your witness to our Faith and for your friendship. We will keep the Littletons in our prayers. P.A. Dear James and Kathleen, We were so happy to see you. Your beautiful family and your living faith on TV last night. Your life, your love and your faith is a great example to our Catholic faith. We thank God that such families do exist in our society today in this day and age. James, Kathleen we are so proud of you for raising so many children for your community. It just shows how unselfish you are. Let your children be a shining star and a guide for all the people around you. I too come from a large family. My mother and father had twelve children. My parents were very proud of us. I understand your family as we too had a very Catholic upbringing. I look back and I thank God for all those happy years we had together. Sadly my parents have gone to God and I miss them very much but we continue to carry the beautiful faith they gave us which no man can put a price to. We pray that you both will have a wonderful long and healthy life together for your children. As from my own experience I know that the most valuable gift and asset you can have in your life is your loving parents. May Our Blessed, kind, loving and compassionate Mother and Our Merciful Jesus grant you and your family all the Blessings that you deserve. May they keep you all under their loving protection always. We thank you for coming alive on EWTN last night and for inspiring us. Saw the show. Very impressive. I wish I could start over on my kids and follow their way of doing things, C.F. Dear Kathleen and Jim, What a beautiful witness of your faithfulness To Jesus Christ, and all he has done in your lives!! What a wonderful testimony last night on TV!! We had to search the neighborhood to find someone who had EWTN, and after running to a couple of houses who all thought they had it, we finally found one that did!! It was perfect, as the house we watched it at, would have never watched something like that on TV, and I could tell throughout the show how they were just drawn in by what you had to say, and it had a powerful impact on them!! Thank you for being such a gift to all of us!!! Your faith, Love, and charity, has touched us in so many ways, especially in our own walk with Christ. You have Inspired us to adopt these 3 new little ones coming our way, and we will always remember all the time, and support you have given us. Blessings upon you always, and thank you from the bottom of our hearts. P.G. I just saw you on EWTN and was riveted to the television! Your story and ministry is amazing; keep up the good work!! We really appreciate hearing from families like yours; it is inspirational! G.C. I am touched by your story. I come from a family of nine brothers and sisters. I enjoyed every moment. Love and God bless you abundantly always and may your story reach others. L.G. I just delighted in watching and listening to you on EWTN Live this evening! M.P. Also I think this is the "most powerful message for LIFE." N.M.
My wife and I are parents to 8 children. We watched you on EWTN Live last week. How blest are you and your family. It is inspiring to see other large families living out their Catholic faith. 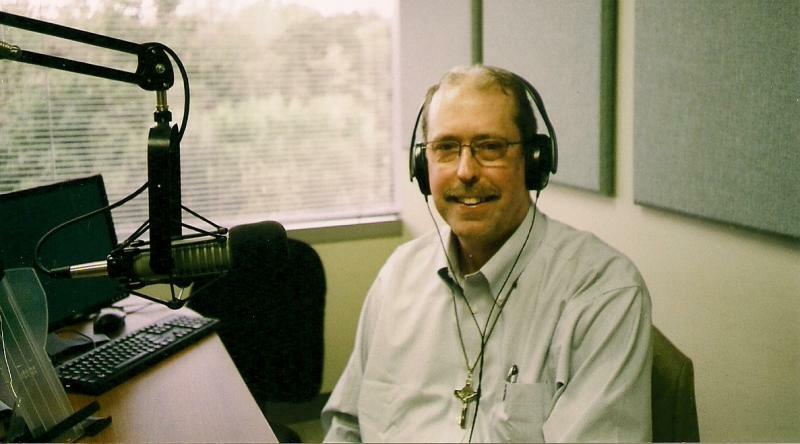 We enjoyed hearing about you on EWTN and plan to get a copy of your book in the near future. P.C. "Thanks so much for your anointed radio program. I listened to the Podcast including the topic Healed through Poverty early on Sunday morning and was greatly encouraged." "I plan to keep in touch with you, if you do not mind, because your program has enlightened me in your relating Scripture so clearly. I am grateful for your teaching of the Word of the Lord and your testimony. Thank you again, and God bless you and your wife and family and all you do to draw others closer in a love for and better understanding of God's Word. I shall be praying for you." "Jim, I listened to most of your program this morning. It sounded great. Good thing you have such a good face for radio:)"
Transformative, compelling, and filled with hope! Littleton literally pours out his soul to share with others the profound peace that is gained when we join our suffering with Christ’s. Healed through Cancer is a testament that anyone and everyone can experience healing if they avail themselves of His mercy and love! I am privileged to recommend the book Healed through Cancer. The path that the author James Littleton has walked is very inspirational. The fact that he invited God to join him on each step of the journey is a great act of faith. The hand that James was dealt was one that all of us fear. James did not shirk from this hand and instead embraced it through God and scripture. A marvelous journey of success through hope, humor, prayer, family, and faith. A great read for all. Jesus said, “Ask, and you shall receive,” but he didn't say what we'd receive. So many people assume that we receive what we ask for. But our Father knows our needs better than we do, and often He gives us the healing we need rather than the one we want. We're healed through poverty, illness, adversity—even cancer. James Littleton has known such healing and wants us to know it, too. This book will surely arrive as an answer to many people's prayers. This book is a catechesis for joyful living, written with the eloquence of one who in his sufferings has intimately experienced the love of the Cross. It is for those who suffer from illness, from impatience, from pride, from sin, from fallen human nature…it is a book for everyone. Our Lady of Guadalupe, pray for us. Healed through Cancer by James Littleton is a treasure trove of faith, scripture quotes, and brotherly advice, as well as a personal account of one man’s journey through cancer and the fruits of that journey. With depth and understanding,Littleton takes his readers through the physical, spiritual, and emotional “valley of death” as he learns of his Chronic Lymphocytic Leukemia cancer diagnosis, decides upon and endures various treatments, and wrestles with the issues of living his faith through this experience. In Healed through Cancer, the reader will read moving diary posts that contain wit and wisdom, and consider life’s big questions in relationship to suffering, such as the age old query, “Why ME?” Littleton also addresses the general question that has plagued man from the beginning of time—why is there suffering in the world and what is its use? Imagery is rich and examples are many in this chronicle of faith and fortitude. The author includes an appendix with an examination of conscience and passages of scripture that address healing.Littletonstresses that nothing happens without God’s permitting it, and that suffering, when united to Christ’s on the Cross, can be redemptive. His story of faith and hope will encourage the cancer-stricken, buoy their families, and give faith and light to a suffering world. I am honored to recommend the book Healed Through Cancer. I was very moved by the author’s story depicting his plight in dealing with such an unexpected illness. Having been diagnosed with CLL myself last year, I found the book to be very inspirational for me personally. I truly admire the author for his inner strength, his spirituality, faith, determination, and success in confronting what God has put before him. I urge everyone to read this very inspirational and touching story. In his book, Healed through Cancer, and Other Adversities, Jim Littleton provides an example of what it means to be a true follower of Christ. When asked by Jesus to “deny himself and take up his cross daily and follow Me” (Luke 9:23), he did just that…and continues to do so. As a Catholic lay evangelist, I constantly stress that our faith involves more than learning facts. Once learned, those facts must also be lived. Here is the story of a man who is doing so in an inspirational and heroic way. I strongly recommend this book for anyone who, like me, tends to lapse into the bad habit of complaining about daily annoyances and who needs a reminder that “God is faithful and will not let you be tried beyond your strength; but with the trial he will also provide a way out, so that you may be able to bear it” (1 Corinthians 10:13)! When my wife Kathy and I saw James and Kathleen Littleton on EWTN Live telling the story of Better By the Dozen, Plus Two, about their wonderful family of nineteen children (fourteen living), we were impressed. When, a couple of years later, I received an invitation to review James Littleton’s Healed through Cancer: and Other Adversities, I was delighted. Now that I’ve finished reading it, I am very much honored and grateful as well. Healed through Cancer, and Other Adversities is a powerful, moving, loving, and very important book. In sharing the story of how he and his family have been impacted by his diagnosis with a particularly aggressive form of Chronic Lymphocytic Leukemia, James Littleton has crafted a book full of joyful, charitable lessons for us all. Far from a sorrowful tome, this book pulls no punches in recounting suffering, but explains with care, wisdom, and humor how it is all worthwhile. Healed through Cancer, and Other Adversities is also a paean of gratitude to God for marriage, parenthood, family life, and all of our abundant blessings. It is a courageous testimony to all human life. You will read, for example, how the author, due to his unyielding respect and love of life, refused to participate in two experimental treatment methods that would have required the use of artificial birth control methods. Healed through Cancer, and Other Adversities is a bountiful resource for those who would understand the meaning of suffering and illness as explained in the scriptures and the teachings of the Catholic Church. Note well the through in the title. James shows how God can use even cancer as a means of spiritual healing. Far from embracing victimhood,Littleton provides hope for the ill and encourages the afflicted themselves to continue to be “pourers,” pouring out their love and encouragement to others. I recommend this book without reservation to anyone suffering from cancer or any serious illness or trial, to their family and friends, and to any reader who would care to profit from the heartfelt wisdom and joy of a man who has been blessed with so many good things, and with difficult things as well. God´s infinite mercy is for all of us! Author James M. Littleton´s faith testimony about the intercession of our Lord Jesus Christ in his life stays strong while he embraces the Cross of cancer, trusting on the miraculous action of the Holy Trinity. The Holy Eucharist and Virgin Mary´s Holy Rosary are essential for the spiritual battle. If you are searching for an inspirational spiritual conversion journey experience: Healed through Cancer, and other Adversities is the book! Eduardo Ramos Olivera, Catholic Screenwriter & Writer"
I thoroughly enjoyed and loved reading this book. It will prove to be a source of inspiration to each and every reader. It doesn’t matter whether that person has been in the same situation as James Littleton or not. It doesn’t matter what the form of sickness, but the truth is this book will provide a wonderful healing spiritually, and also provide a good frame of positive mental attitude, which I believe is so important when one is suffering from ill health. What is or has been the length of your mountain range in carrying your cross during your crisis? Mentor in mind and heart Jim's sacred journey in his love for God and scriptures, and receive miracles of hope! Heaven Offering Perpetual Exhilaration! I found Healed through Cancer, and Other Adversities inspiring. It will provide hope to many people! It is a healing gratitude book. Many blessings!